Strange as it may seem, there’s a case to be made that Stand in the Fire is the finest outing in Warren Zevon’s canon, which makes it all the more perplexing that it has taken until 2007 for the set to make its debut in the digital age. Augmented with a quartet of stellar bonus tracks, it has never sounded better. There’s no doubt that Jackson Browne’s approach in the studio was instrumental to re-launching Zevon’s career, but by softening the arrangements of his songs in order to make his self-titled affair and Excitable Boy suitable for mainstream consumption, Browne also tempered their raw potency. Captured over the course of five nights in 1980 at the Roxy in Los Angeles, the music on Stand in the Fire bristles with energy and intensity. Indisputably, this is the way that Zevon’s early tunes — Excitable Boy, Johnny Strikes Up the Band, I’ll Sleep When I’m Dead, and Play It All Night Long, among them — were meant to be heard. 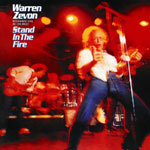 Stand in the Fire begins in a solid but unassuming fashion, but the sentiments that Zevon expresses during the title track establish the tone that hangs over the rest of the collection. Newly sober but pumped full of painkillers and steroids to treat a strained nerve, Zevon gave a bracing, edgy performance that seemed designed to use the power of rock ’n‘ roll to purge the self-destructive tendencies from his soul. Nearly 27 years after the fact, the music continues to burst full-force out of the speakers with a three-dimensional fury, and the violent mayhem of Zevon’s lyrics reverberate through the driving rhythmic crunch, sharp stabs of guitar, and raucous piano that had been provided by him and his backing band. Though Stand in the Fire was culled from multiple performances, it feels entirely cohesive, and as it progresses, Zevon’s delivery grows increasingly manic. The tightly knit tension of the title track slowly gives way to the all-out punk revolt of The Sin, and the playful nods to pop culture that are tucked into Werewolves of London become the cajoling exhortation to dance that is directed, during Poor Poor Pitiful Me, first at his road manager and then at the rest of his crew as well as his audience. Even Mohammed’s Radio, the lone ballad on the original album, is transformed, its sludgy pace enveloping the song in a weary sense of desperation. The final two cuts (Frank and Jesse James and Hasten Down the Wind) on the new incarnation of Stand in the Fire, however, stand in sharp contrast to the rest of the material on the set. Seated at his piano, Zevon allowed himself to settle softly into a state of quiet reflection. His voice, tattered and frayed from his earlier outpourings of angst, initially exuded an air of defeat, but as the cheers from the audience rose up to meet him, the pain of his past relationships began to melt away. Left in its wake was the warm, familial embrace of salvation and rebirth that he had been seeking all along.